Whether you're just starting out and need a cheap classical guitar to nail the basics or you're a more seasoned nylon string plucker on a budget, this page will help you whittle your choices down to the top 3 under $300. As always, the classical acoustic guitars below have been chosen based on hundreds of strong reviews and plenty of positive buzz in the forums and across social networks. It all adds up to a pretty clear consensus on which guitars stand above all others in this price range. Best For Beginners or guitarists on a shoestring budget who still want good quality. Guitarists who want a mellow, traditional classical guitar sound. Guitarists who want more concert projection & louder presence. If you're a nylon string newb, or even looking to buy your first guitar, you can always trust Yamaha to offer a fun, ultra-playable and great value starter guitar. You can get hold of this one as a $150 package including gig bag, digital tuner and DVD lessons as a sweetener for beginners. For a "no frills" cheap classical guitar, it's the basic things you're looking for - stable tuning and accurate intonation, solid build and a balanced tone with decent sustain and projection. The C40 checks all these boxes. Sure, you won't find much unique character in what many would classify as a "school music block beater", but the C40 is produced at a consistently high quality and actually delivers above and beyond its role as a student primer. With classical acoustics, there's even more emphasis on technique to shape the overall tone, which is why you can be in a guitar shop comparing a $150 beater to a $3000 Ramirez and not hear a huge difference. The C40 delivers a balanced tone with good bass response, not too dark or tinny. Its responsiveness allows students to develop their picking technique. Beginners will also appreciate the ease of playability typical of Yamaha guitars. Low action out of the box, touch sensitivity and a comfortable neck. 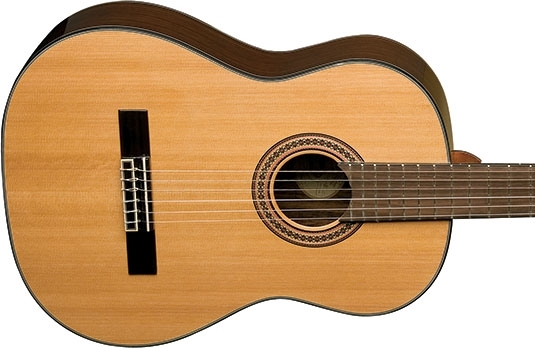 Overall, many experienced players have recommended the C40 as the top choice cheap classical guitar for beginners. It's always a bonus to find a decent solid top in this price range, and with great playability and tone, Washburn have produced yet another high quality acoustic bargain that will cater for even the most experienced ears and fingers. An especially beautiful classical guitar with impeccably finished rosewood back and sides. Users praise the high quality workmanship, tidy gluing and enough give to shave the action right down without buzz. So it's worth tampering with a bit if you find the factory setting a tad high. The solid cedar top gives you a warm, mellow tone. In its element, the C80S handles those somber, understated melodies very gracefully. The factory strings might not be to your taste, so don't be too quick to judge the C80's tone out of the box. Many recommend Pro Artes to bring the guitar to life. If you're after more of a concert presence, the obvious choice is spruce over cedar, but for those who prefer a more traditional, warmer resonance from a classical, with the right strings there is enough volume here for a good home recording. With higher tension strings, for example, you get a lot more volume and response out of the C80S, but retain that warm, mellow undertone from the cedar top. The result is a beautifully balanced tone. There seems to be a common occurrence of people buying the C80 as a "beater" and then finding themselves using it for greater things. So there is definitely an element of Washburn exceeding expectations. The C80 has enough individual character to sweet talk players away from their more expensive guitars. Altogether louder, bolder than the Washburn, with the same impeccable build and finish quality. This is for players who want their classical to have a bit more attitude. The Cordoba C5 will give you the projection and articulation you need in a concert setting. The C5 classical acoustic, above anything else, proves that just because a guitar is made in a Chinese factory does not automatically make it of inferior quality. Even just the beauty of the rosewood fingerboard has called for repeated comment. The deep finish mahogany sides give the cedar top more bass-mid presence and a pleasant volume boost. This combination of cedar and mahogany produces a very clear, balanced articulation. The cedar top smooths out the treble and mids meaning you get the extra volume from the mahogany, but without losing too much mellow warmth classical players love. Overall, there is tremendous clarity at every frequency of the C5's tone that gives it a much brighter resonance than the gentler, more understated C80S. The C5's loud yet perfectly balanced articulation - strong bass, smooth mids, crisp highs - is not a combination you'd expect to find on a cheap classical guitar. Overall, players have agreed the C5 stands on its own along side far more expensive guitars, with some expressing a mixture of surprise and confidence in its very able concert projection. That perhaps sums up the key difference between the Cordoba and the Washburn - the C5 will fill a concert hall, whereas the C80S, in all its unique beauty, will grace more reserved, introspective playing and recording sessions.